If you spot a lone shoe, it may be a sign from the Universe worth paying attention to. Shoes can represent the path we are following, and finding a lone shoe along your path is a sign that you may be contemplating a new path, but haven't completely committed to it. You may have "one foot in", so to speak. 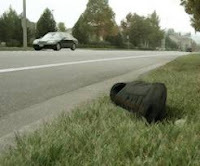 A lone shoe could also represent a plan you once had that was abandoned or forgotten. Perhaps it's time to revisit and rekindle it. Or maybe its time to bury it for good. For further insight, look to where you were going when you saw it, the major issue that was on your mind when you saw it, or...if applicable, the conversation you were having when you saw it. The type of shoe could have significance as well. For example, a workboot could represent an opportunity with work or career...but if relationship is the major issue in your life, it could be an omen that the relationship needs a lot of "work" and full commitment on the part of both involved will be required. It's not a good or bad omen, it is simply urging you to consider what you really want. Maybe your dream just needs a little revision. Get some perspective, decide and then commit yourself! Jump in with both feet!